Ajwain, ajowan (/ˈædʒəwɒn/), or Trachyspermum ammi—also known as ajowan caraway, bishop's weed, or carom—is an annual herb in the family Apiaceae (or Umbelliferae). Both the leaves and the seed‑like fruit (often mistakenly called seeds) of the plant are consumed by humans. The name "bishop's weed" also is a common name for other plants. The "seed" (i.e., the fruit) is often confused with lovage "seed". The plant is mainly cultivated in Iran and India. Rajasthan produced about 55% of India's total output in 2006. ^ "Trachyspermum ammi". Germplasm Resources Information Network (GRIN). Agricultural Research Service (ARS), United States Department of Agriculture (USDA). Retrieved 11 December 2017. ^ "ajowan - Definition of ajowan in English by Oxford Dictionaries". Oxford Dictionaries - English. ^ "Bishop's Weed". SPICES BOARD INDIA. Archived from the original on 14 October 1999. Retrieved 14 August 2015. ^ Bairwa, Ranjan; Rajawat, BS; Sodha, RS (2012). 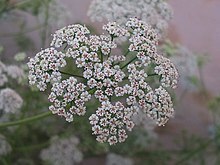 "Trachyspermum ammi". Pharmacognosy Reviews. 6 (11): 56–60. doi:10.4103/0973-7847.95871. PMC 3358968. PMID 22654405. ^ Singh, Gurdip; Maurya, Sumitra; Catalan, C.; de Lampasona, M. P. (June 2004). "Chemical Constituents, Antifungal and Antioxidative Effects of Ajwain Essential Oil and Its Acetone Extract". Journal of Agricultural and Food Chemistry. 52 (11): 3292–3296. doi:10.1021/jf035211c. PMID 15161185.